Weekly Wrap Up-- Year #4 Week 23 The Week We Went on Vacation! We had a short week of school this week since we had the best field trip ever planned! 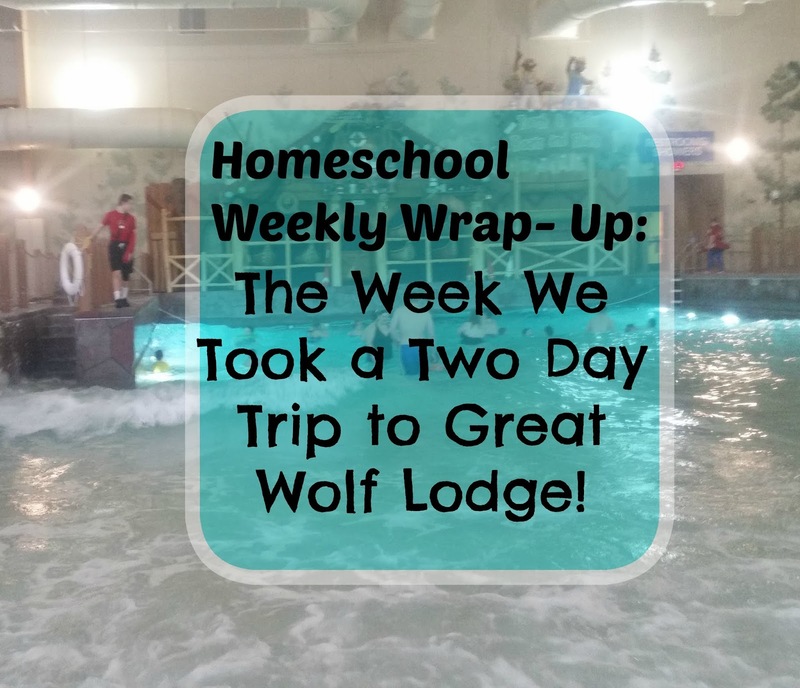 A homeschooling family set up an overnight trip to Great Wolf Lodge New England and we decided that sounded just perfect in February! We had the best time and knowing we were going to be taking two days off of school for some fun the boys worked extra hard. It sure was a fun way to end our week. 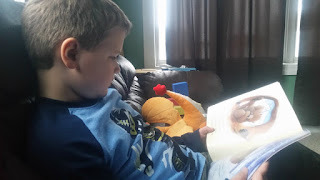 Reading-- Alec read his Wings of Fire book over the weekend; finishing it up. He also finished reading Tales of the Fourth Grade Nothing and started reading Superfudge. 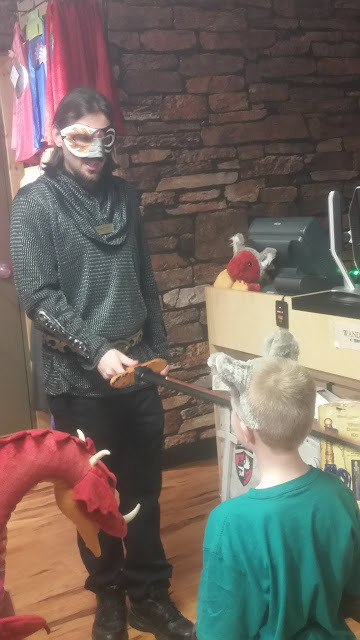 He also read some more of Gameknight 999 Confronting the Dragon aloud to Evan one night when they had a sleepover together. Evan read Bear Snores On, Learning to Read with Planet Earth; Snakes, and Learning to Read with Planet Earth: Bats. Ian read a good half dozen chapters in his Treasure Hunters book as well as reading The Diggers are Coming. We finished up The Magician's Nephew and read a few more chapters in The Hero's Guide to Being an Outlaw. History-- We watched Max over the weekend and related so much of the movie back to the book Cracker that we read. We also read a bit more of Who Was Marie Antoinette and Tale of Two Cities working on our French Revolution unit. Physical Education-- We went bowling this weekend and had fun celebrating a friend's birthday. The boys also had karate this week and we went on a lovely nature hike. It has been beautiful and sunny and fairly warm here. 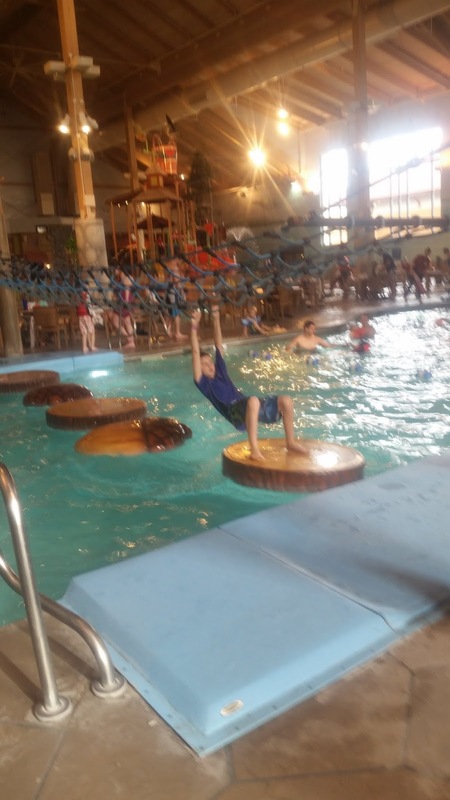 We also got lots of exercise swimming, climbing the stairs to all the water slides, and walking all around Great Wolf Lodge. 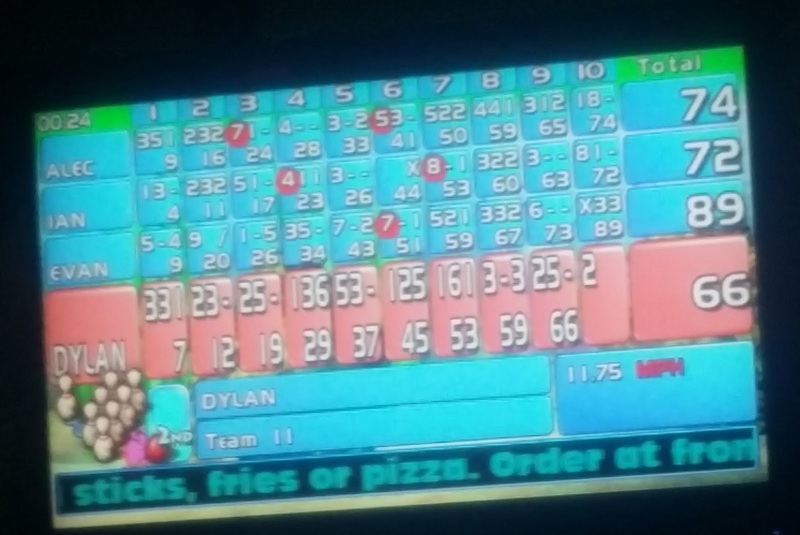 Evan surprised us all with his bowling skills this week! Writing-- We read The Boy Who Loved Words together one day this week and then the boys had to pick five words out of the secret bag and use them in their stories. 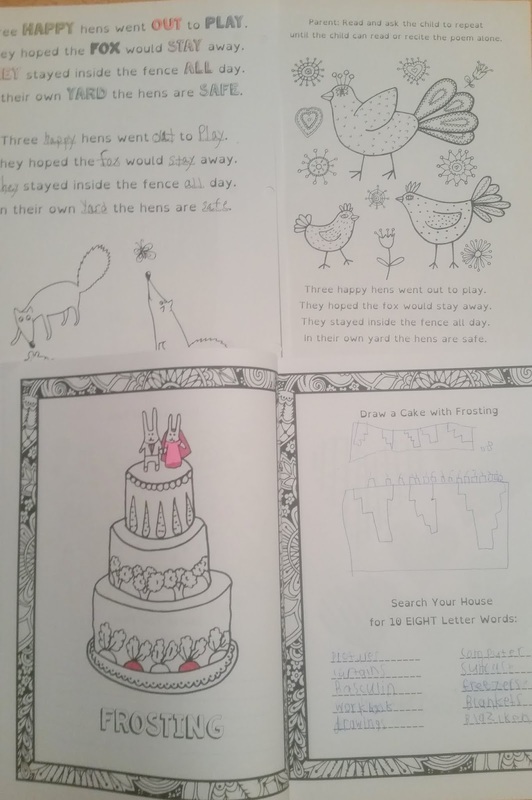 They seemed to enjoy this task and I actually had the older two boys write longer stories than requested! We had a fun and quick writing activity on our trip to the library! February is all about love at our library and the boys were encouraged to write why they love the library (or why they were visiting the library) onto little colored index cards for the librarians to make up a huge town-wide bulletin board showing how much we all love and depend on the library. 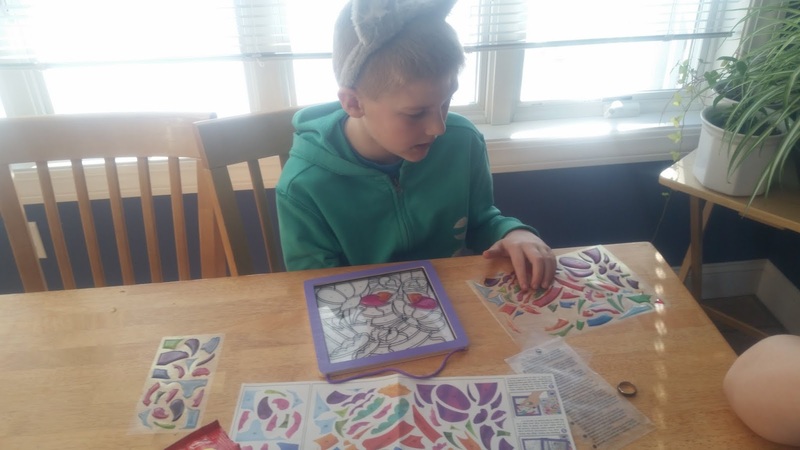 Art-- Alec bought himself another stained glass made easy kit and spent part of the week putting together his Hummingbird. We now have these lovely, colorful stained glass displays in so many of our windows. Math/Logic-- The boys worked on 6 more pages each in their math workbooks. The older two boys also completed another set of pages in The Thinking Tree Math Genius book. 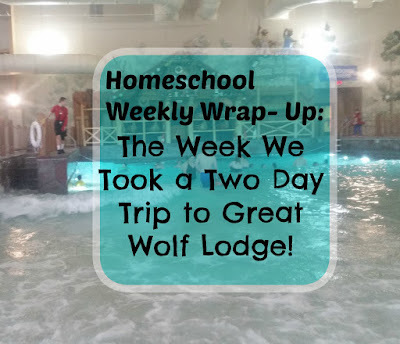 They all used lots of real life math this week when spending their money at the store and budgeting for how much to save to use at Great Wolf Lodge. 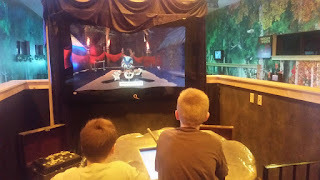 The younger two boys also played Magic Quest at Great Wolf Lodge; a scavenger hunt game that requires a lot of problem solving and memory to play. They both were knighted in a knighting ceremony after completing all the tasks! Science and Nature- We watched another episode of Mythbusters. We went on a nature walk and examined the effects of the warm weather on the snow and ice. Life Skills- The boys packed their own suitcases for our trip and even helped me plan meals and pick what foods to pack. They did well budgeting their money too. 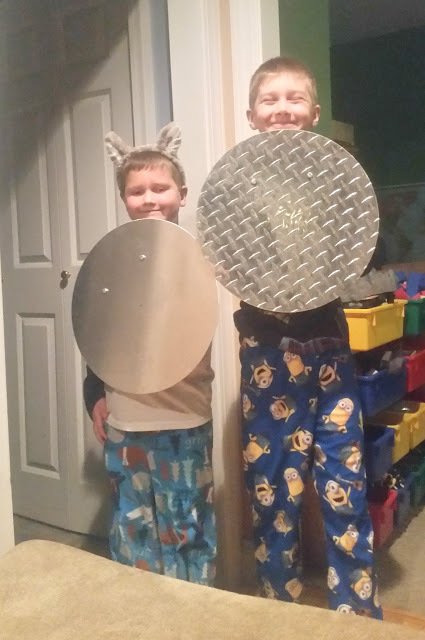 Ian went to work with his grandfather over the weekend helping him out while the younger two boys went with their father to his work to learn how to use some of the tools in the metal shop to make their own versions of Captain America's Shield. Cross Curricula-- We played Trivia Crack together one afternoon. Turns out Evan is a real pro at trivia... Alec ultimately ended up winning but Evan was such a close second that I was just amazed. Geography-- The boys all picked their geography fair topics and we started requesting books, picking out their snacks, and trying to figure out a hands on component to go with the topics of Australia, France and the Polar Regions (you can read about our pick of books for learning about the Arctic here). 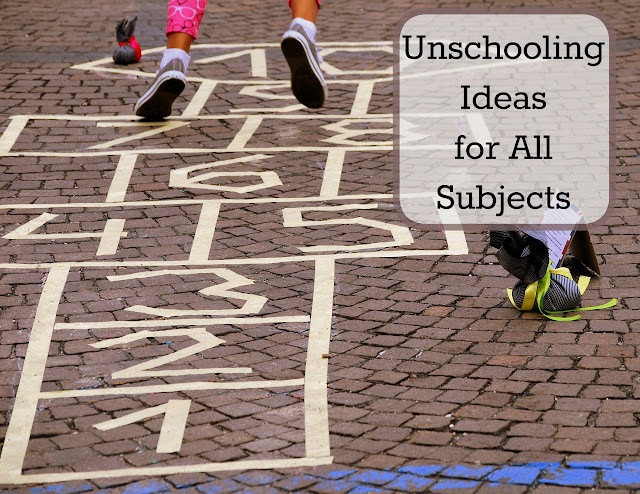 We've hardly begun and they already have such great ideas! 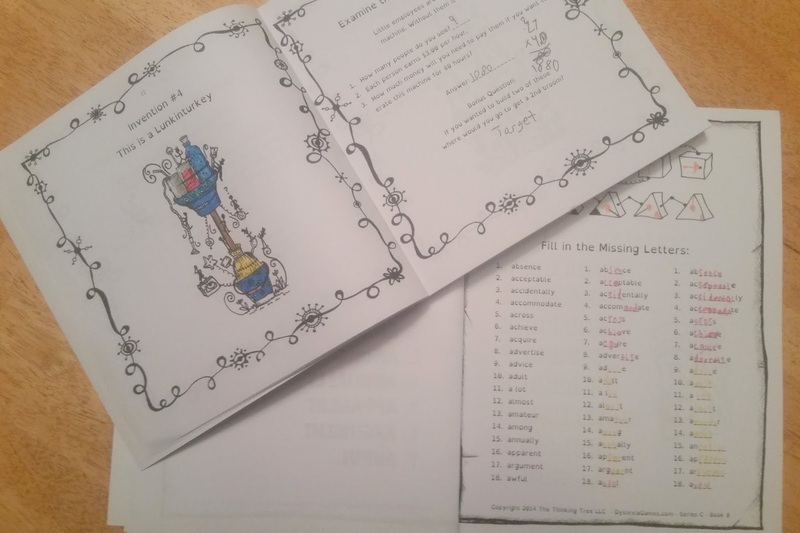 Sight Words/ Language Arts-- The older boys worked on the next pages in both of the Thinking Tree Spelling Workbooks (Fun Selling & Spelling Time). While Evan completed a page in his Star Wars Reading book learning about antonyms. Evan also spent one morning playing a sigh word hop game. We wrote his sight words on sticky notes; placed them in a path around the house and he had to hop from one to the other calling out the word. 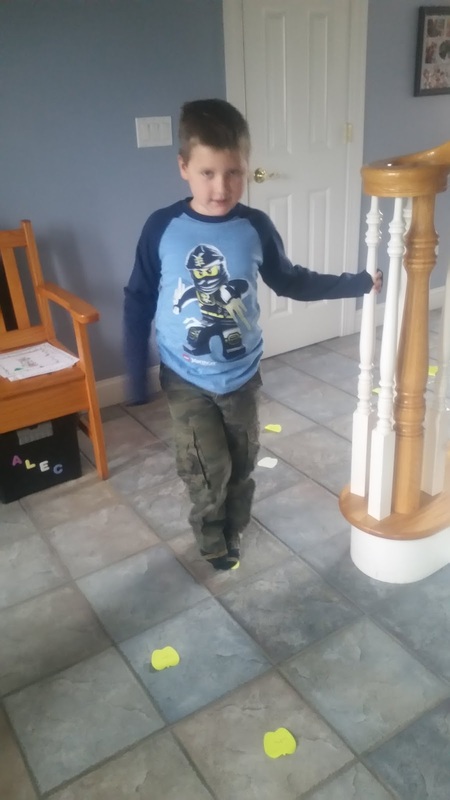 He decided that if he got the word wrong he had to start over every time-- which led to TONS of sight word practice since these words are still fairly new to him. Love the sight word hopping! My kids loved the movie Max. The GWL looks like fun!! It is! but 24 hours is enough time in the water for me! I was so happy to get home. A trip to the Great Wolf Lodge sounds PERFECT! 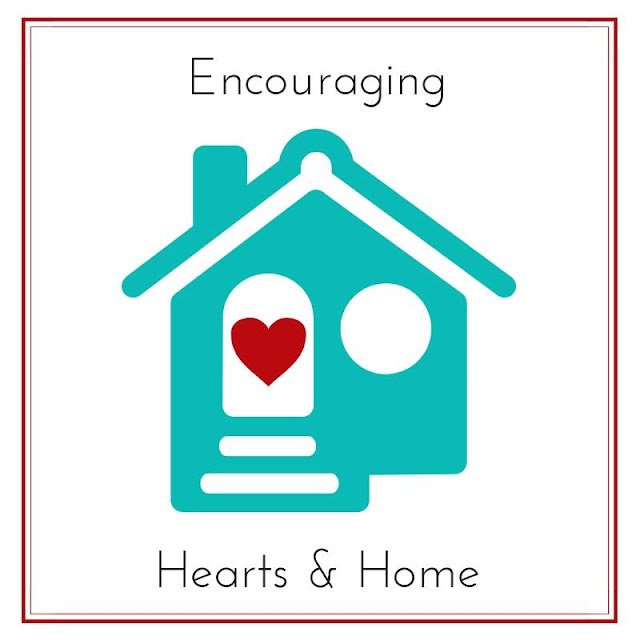 Thanks for linking with Collage Friday! It really was! Such a fun way to take a break from schoolwork and recharge. Great Wolf Lodge is so much fun, we went a few years ago and the kids loved Mage Quest. One of my boys is reading the GameNight999 books right now and is loving it. Our only minor complaint is that both times my boys have done Magic Quest some portion of the dragon adventure is broken and they still have not been able to battle the dragon. But they were mollified that they could get knighted without it since it was not their fault that they could not complete it. It was! And now today we're being buried by thick, heavy snow and the boys are just thrilled with that too. Looks like another accomplished week =) My kids would LOVE the moving bridge. How fun. 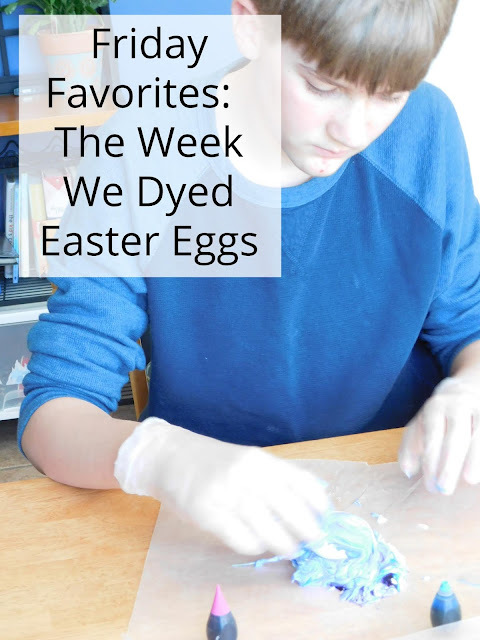 Thanks for checking out our week. We ordered some new Thinking Tree journals this week.... hopefully they'll be in by Thursday for the link up. Ooh, how fun. I'm waiting on a few too. I snagged the Boys Winter journal when it went on sale. Now it's even lower. I keep debating whether I should get another one, lol. 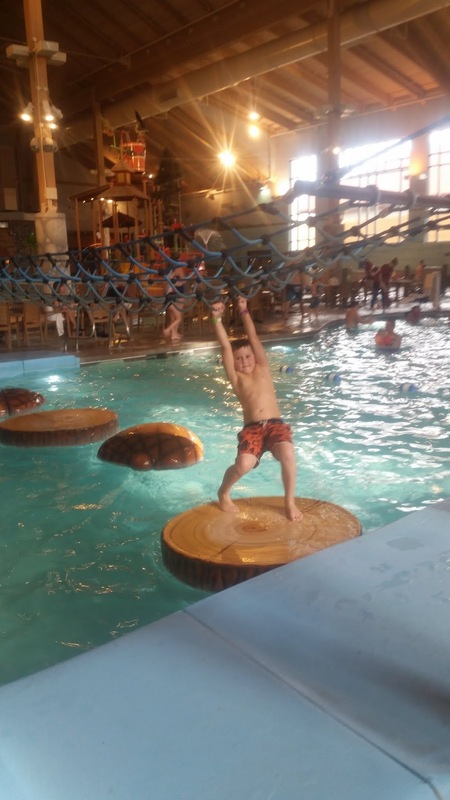 My kids loved Great Wolfe Lodge! 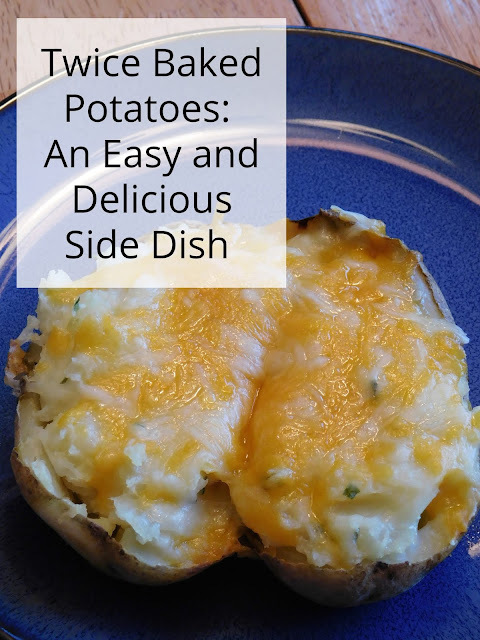 Yours looked like they had a ball too! Greta week leading up to that surprise too. 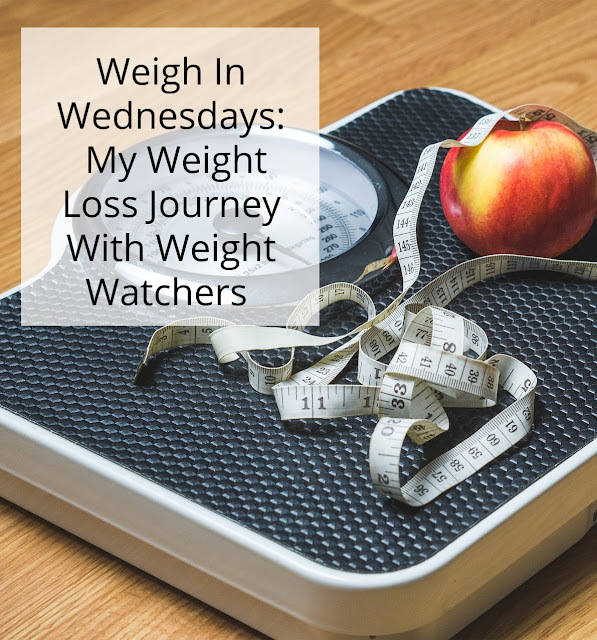 I'm visiting from Weekly wrap up. Awesome week! What a fun yet educational way to wrap it up. It really was a fun week. We have a Great Wolf Lodge about 2 hours form us, and I'm hoping we can get there this spring. Looks like a great week! The boys sure enjoy it. I'll admit it's not my favorite; I don't typically enjoy walking around in a wet bathing suit for very long though so that's probably why.